New dates added to The Music Made Me Do It Again! Tour 2019! Ted has announced several new tour dates on the upcoming tour, The Music Made Me Do It Again! See below for information these newly announced dates. Head to the Tour Page to see all of Ted’s upcoming tour dates, ticket information or to become a DangerZone VIP! Ted introduces his new podcast, The Ted Nugent DangerZone with Tim Wells, available on iTunes now! This podcast covers a range of topics through different perspectives with special guests like politicians, hunters, blue-collar workers, celebrities and more. Listen now on iTunes! Ted announces a new tour for 2019 – The Music Made Me Do It Again! The Nuge has announced six dates in California on The Music Made Me Do It Again! 2019 tour. Tickets and exclusive TedNugent.com Dangerzone VIP Packages are on sale now. Visit the Tour Page for more details. Along with a ticket to the show, Dangerzone VIP Packages include a pre-show meet and greet with Ted, a photo of the Nuge for autographing, a VIP laminate and more! For those who have purchased their tickets already, a Dangerzone VIP Package Upgrade option is also available. Stay tuned for more tour date announcements to come! The Music Made Me Do It: OUT NOW! The Music Made Me Do It, Ted’s 14th studio album is OUT NOW! This CD/DVD set includes 10 brand new Ted Nugent tracks, and the full live performance at Freedom Hill in Sterling Heights, MI. If you haven’t already, grab your copy from the TedNugent.com Store or stream The Music Made Me Do It on Spotify or pick up a digital copy on iTunes today! Nuge Java Now Available in Whole Bean! You asked and we answered! Ted’s wildly popular coffee is now available in whole bean! Pick up one (or all three!) of Ted’s amazing blends – The Original, Sin-O-Man and KillerBrew Hazelnut, exclusively in the official TedNugent.com Store. Ted’s latest article is now live on TedNugent.com. In it, he discusses the various daily rituals that mean so much to him, not least of which, the archery rituals that fuel him with a new bowhunting season fast approaching. Check it out here! Share this with all your music-loving friends— then tell them the music made you do it! Ted Announces Two More New Tour Dates! Ted will bring The Music Made Me Do It tour to two more lucky venues in the US this July! Tickets and exclusive TedNugent.com Dangerzone VIP Packages are on sale now! Please see the dates listed below, and visit the Tour Page for more details. Ted Announces Six New Tour Dates! Ted will bring his summer tour to six more lucky venues in the US this July! Tickets and exclusive TedNugent.com Dangerzone VIP Packages are on sale now! Please see the dates listed below, and visit the Tour Page for more details. Five New Dates Announced For Ted’s Summer Tour! 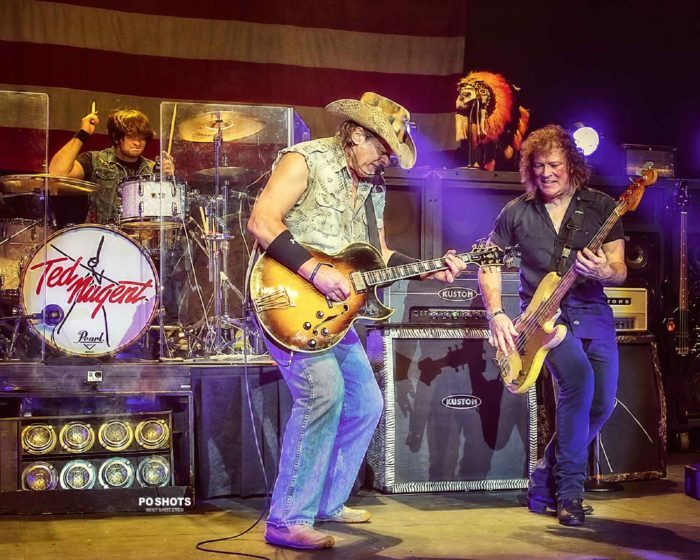 Ted has announced five new dates for his 2018 summer tour!Tickets and exclusive TedNugent.com Dangerzone VIP Packagesare on sale now! Please visit the Tour Page for more details. Stay tuned for more tour date announcements to come. More Dates Announced For Ted’s US Summer Tour! Ted has announced new dates in Pennsylvania, Ohio, Indiana and Illinois on his 2018 The Music Made Me Do It tour! Tickets and exclusive TedNugent.com Dangerzone VIP Packages are on sale now. Please visit the Tour Page for more details. 2018 TOUR DATES ANNOUNCED IN CALIFORNIA! The Nuge has announced six dates in California on The Music Made Me Do It 2018 Tour. TedNugent.com Dangerzone VIP Packages are on sale now, and tickets go on public sale March 9 at 10am PST. Please visit the Tour Page for more details. This is just the beginning! Stay tuned for more tour date announcements to come. Start your engines and get ready to ROCK! Ted will be performing at the Iowa Speedway on July 7, 2018! The race starts at 7:30pm and Ted hits the stage at 9:30pm. All you need is a ticket to the race! Get yours here. Introducing the world’s first Ted Nugent Signature Series AR 15-style Uppers! These one-of-a-kind upper kits come in three distinct styles: the US Flag Pattern, the Zebra Stripe pattern and Traditional Gun Black. All feature Ted’s iconic signature logo. For complete details or to pre-order, visit aagilarms.com. HolyHoly God in Rock-N-Roll Heaven ya all! What on God’s good green BBQ earth was THAT! Only the greatest damn tour of my life that’s all! A Full Bluntal Nugity ultraGONZO THANXSALUTE to the slamminest groovinist rhythmgodz Jason Hartless & Greg Smith for unlimited heart & soul every song every gig everynite! THANXSALUTE to the hardest workin most professional kickass crew & team! THANXSALUTE to the greatest honest to God soulmusicloving audiences this MotorCity guitarjammer could ever dream of for the highest energy & fiery positive spirit every damn night! Wrapping up the 6628th gig of my life so far was literally the highest of natural out of body highs available to mankind and I can hardly get next to myself! Off for gig #6629 in Okinawa Japan for the mighty United States Marine Corp warriors soon to put the ultimate clamax eargasm on the greatest tour of my life! We are already booking July2018 so greaseup those dancing boots for more phenomenal all American breeding music next year! Have the greatest hunting season of your lives to cleanse your soul and keep you Spirit of the Wild strong and free! Godbless Godspeed you all! Nuge met with veterans prior to his Grand Rapids show on August 18. Visit our friends at WZZM13.com for the complete story. It’s happening live on Wednesday, August 16 at 5 pm Eastern. Deerfest is Happening This Weekend – Don’t Miss Ted! Larry Polenske wrote a great preview on what to expect from DeerFest this weekend, where Ted will be giving a spoken presentation August 5, at 2pm! DeerFest is happening at the Washington County Fair in West Bend Wisconsin August 4 – 6. Get your tickets HERE and read Larry’s preview below. Ted recently took to the airwaves to discuss the summer tour as well as The Freedom Coalition, an initiative and petition to stop the injustices befalling numerous Americans, who are now in prison as a result of out-of-control federal regulations. Meet Ted at the Kentucky Ultimate Outdoor Expo! Ted will be appearing at The Kentucky Ultimate Outdoor Expo on August 27 for a presentation, followed by a meet and greet! Don’t miss this opportunity to chat with The Nuge himself. Get your tickets today: http://UltimateOutdoorExpo.com/13-ticket-information.html. Ted Nugent Presentation and Meet & Greet from 2-4pm!